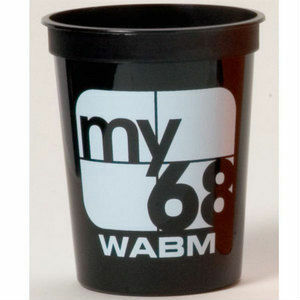 Give your marketing campaign a unique touch for a low price with promotional stadium cups. By imprinting your logo, name, or event date on a cup you can give people a re-usable advertisement that reminds them of your business or event. Unlike traditional printed advertisements, customized stadium cups are kept far longer and give your business a greater exposure over time. Still not sold? Did you know cups can be used for more than just beverage. People use them as coin collectors, pencil holders, flower pots, and more with a little creativity you can find cups have many uses. So what else could you want from an advertisement that is affordable for any budget and reminds people of your business from repeated usage? Custom printed stadium cups are reusable heavy plastic cups and dishwasher safe which will remind customers of your business when used. 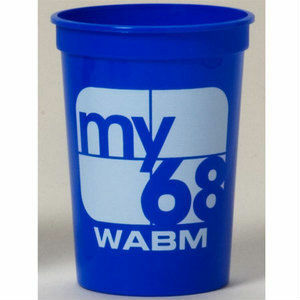 Stadium cups, also called souvenir cups, come in two styles and a variety of colors and are well suited for many events such as picnics, rallies, sporting events, fundraisers, weddings, conferences. 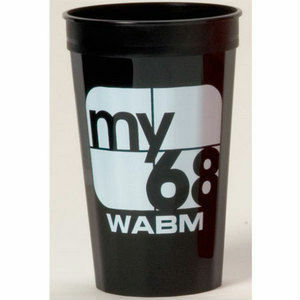 Imprinted cups are inexpensive and make great freebies. 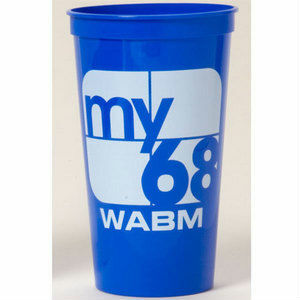 Stadium cups can be imprinted with names, dates, or graphics to create an attractive advertisement. Why invest money in a one time use ad, when you can have an ad that is dual purpose and resuable over time? Still have questions about our product or need assistance with ordering? Contact a customer service representative today through chat, email, or over the phone to get answers or assistance with all the options for your custom stadium cup. Smooth Yellow, black, red, royal blue, frosted, and purple. Smooth Sky blue, lime green, light pink, vanilla, black, red, green, yellow, navy, royal blue, light gray, orange, frosted, purple, teal, and maroon. Fluted Black, red, green, yellow, and royal blue. Smooth Light pink, vanilla, black, red, green, yellow, navy, royal blue, orange, frosted, and purple. Fluted Red, white, royal blue and yellow. Smooth Black, red, yellow, and royal blue. Screen printed 12 oz. stadium cup. Colors: Yellow, black, red, royal blue, frosted, and purple. Cup size: 4 1/8"h x 3 3/16"t x 2 5/16"b. One color imprint on 1 or 2 sides, or wrap. 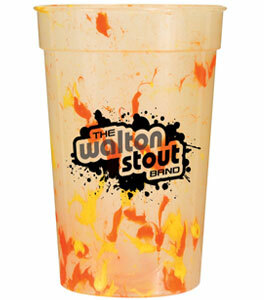 For multi−color imprint, add $25 set−up, plus $.15 run charge per cup per color. For metallic gold, silver or copper imprint, add $.05 each. Neon Imprint: Yellow, pink, green and orange add $.03 each. Unimprinted cups deduct $.02 each from listed price. 24 hour or Same Day service is available at no extra charge. For Multi-Color Imprint or higher quantities, please call 1-800-915-3535 for quote. Shipping will be added after pressing 'buy'. If shipping turns out to be higher or lower, you will be contacted with this information. Screen printed 16 oz. smooth stadium cup. Smooth Colors: Sky blue, lime green, light pink, vanilla, black, red, green, yellow, navy, royal blue, light gray, orange, frosted, purple, teal, and maroon. Fluted Colors: Black, red, green, yellow, and royal blue. Cup size: 4 3/8"h x 3 5/8"t x 2 11/16"b. A one color silk-screened imprint on one or two sides. Unless specified, orders will be Set-Up as a one side imprint. Red/Blue, Blue/Green, Yellow/Orange, Orange/Blue, Yellow/ Purple. Black or White imprint recommended. Standard colors available. Black, White, Red, Lt. Blue, Med. Blue, Dk. Blue, Lt. Green, Med. Green, Dk. Green, Brown, Purple, Yellow, Teal, Orange, Maroon, Gold, Athletic Gold, Silver. Screen printed 22 oz. fluted stadium cup. Smooth Colors: Light pink, vanilla, black, red, green, yellow, navy, royal blue, orange, frosted, and purple. Fluted Colors: Red, white, royal blue and yellow. Cup size: 5 5/8"h x 3 5/8"t x 2 5/8"b. Screen printed 32 oz. smooth only stadium cup. Colors: Black, red, yellow, and royal blue. Cup size: 6 3/4"h x 4 1/8"t x 2 7/8"b. Interested in what we have to offer? Feel free to request a custom quote or call us toll free at 1-800-915-3535! Looking for something besides custom printed stadium cups? Take a look at our other promotional items by visiting our HUGE catalog!